Posted on Sat, Feb 25, 2012 : 10:29 p.m.
Shawn Hunwick recorded a shutout in his final regular season game and the Michigan hockey team wrapped second place in the CCHA with a 3-0 win at Bowling Green on Saturday night. After 45 minutes of scoreless hockey, Michigan’s David Wohlberg finally beat Bowling Green goaltender Andrew Hammond at the 5:07 mark of the third period. Kevin Lynch made it 2-0 at the 8:12 mark. 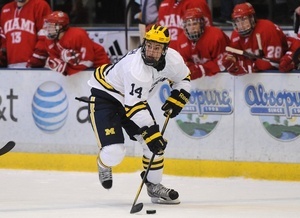 Kevin Lynch, above in this file photo, scored a third period goal to put Michigan up 2-0 on Saturday. "Lynch was terrific tonight," said Michigan coach Red Berenson. "He's a playoff competitor type player and he showed that again tonight." Bowling Green pulled Hammond relatively early in the third to try and spark a comeback, but Mac Bennett scored an empty-net goal at 17:51 to thwart such plans. Hammond kept the Falcons in the game through two periods despite Michigan holding a 31-15 shot advantage. He finished with 47 saves while Hunwick turned away 22 shots to record his career-high fifth shutout of the season and tenth of his career. Bowling Green ended a nine-game power play goal drought on Friday, but couldn't sustain the success through the series as Michigan successfully killed off nine penalties. "I think the most important thing is that we bounced back with a better team effort and we're much better defensively," Berenson said. "We didn't expect to have to kill so many penalties, but I thought our team played harder without the puck. That was missing last night." After failing to clinch home-ice advantage for the CCHA playoffs on Friday night with an underwhelming 4-3 loss, Michigan locked up a second seed in the upcoming CCHA playoffs with the win. "It was a tough weekend. A lot was on the line and we came out with a less-than-stellar effort last night," Hunwick said. "I don't know what it was; it just didn't seem like we were into it. Tonight was a big bounce back win." The CCHA playoffs will commence next weekend, but Michigan will have a bye and await the second lowest seed to emerge as each round is reseeded. Sun, Feb 26, 2012 : 9:01 p.m. Tremendous finish to the season when at one point M was in the lower half. Get in that playoff defensive mode. Shawn has been great but let's cut down the chances against. Sun, Feb 26, 2012 : 3:01 p.m. The CCHA is pure parity this year, just amazing! Keep your heads in the game boys and remember to have discipline on the ice. This is your Championship for the rest to take. Reminder: Joe Louis Arena = Yost 2 (You own that building boys!) GO BLUE! GOOD LUCK!